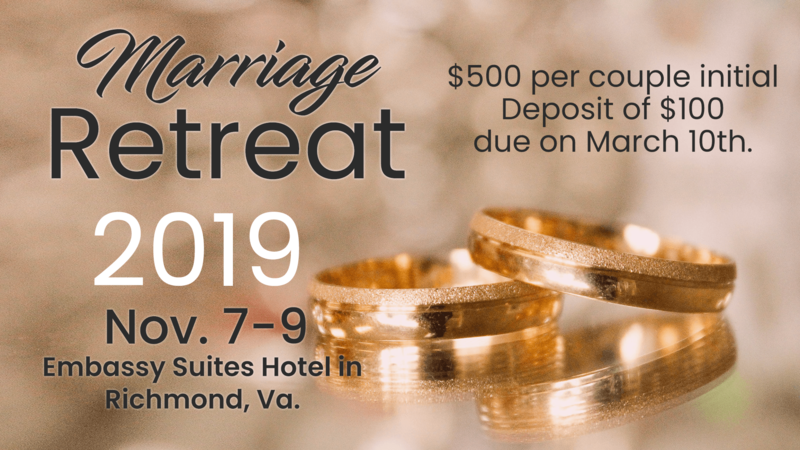 Attention Married Couples: We cordially invite you to join us at our Marriage Retreat scheduled for Thursday, November 7th – Saturday, November 9th at the Embassy Suites Hotel in Richmond, VA. The cost per couple is $500 which includes a 2 night stay in a Deluxe Suite, three meals including made to order breakfast bar, refreshments, and conference materials. Initial non-refundable deposit of $100 is due on Sunday, March 10th. We look forward to a great time of fellowship, instruction, fun and connection. Click here to sign up.